Survival was a PvP-enabled server on nerd.nu. It was taken offline in September 2015 due to lack of popularity. A replacement for it may come out some time after the 1.9 update. 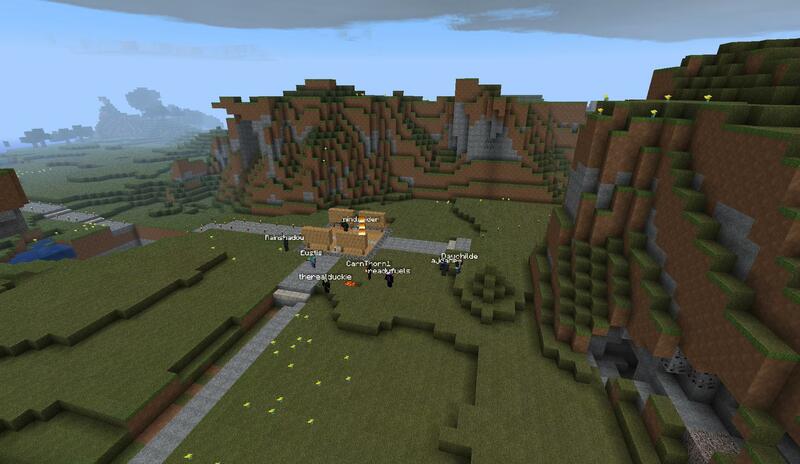 With only a few exceptions, the Survival server was set up as a completely PvP-enabled map. Typically the only areas that existed where PvP was disabled were the starting spawn area, and particular sections of the server's official arena. Everywhere else, players could freely kill one another. This included - but was not limited to - the main roads, underground within mineshafts, and in your own personal homes/bases. Some rules did exist regarding PvP however, and players were advised to read about them here or from the signboards within the spawn building. Combat - whether taking place on the icy main roads or in an arena tournament - was a strongly encouraged component of the Survival server. Everyone had their own personal styles, approaches, and preferences when it came to engaging in combat - and as long as you abide by the rules in doing so, we hope you are able to make the experience playing here an enjoyable one. Additionally, we understand that engaging in combat with others isn't everyone's cup of tea. Whilst we can't guarantee that you will live a life free of a quick stab to the abdomen - in fact, we strongly caution that you more than likely will be on the receiving end of a diamond sword at some point - no one will force you to pick up a sword or bow yourself. Many people enjoy the potential danger brought on by building in such a hostile environment without ever actually starting a fight, and we welcome anyone who chooses to play this way. Notable settlements built upon this style of playing include the town Egreth from Revision 20 and Sanctuary in Revision 21. A full list of rules regarding the Survival server can be found here. New rules may be discussed or added at any time in the future, however, expect an announcement on the subreddit and/or forums when these changes are proposed and eventually put into place. Certain rules are often contested whenever a grey area exists in the application of the ruling, for example when ambiguous problems such as Block Transmuters come about. If you have a concern or question about a particular rule, you are encouraged to ask a staff member about it. If you think a potential rule change warrants greater discussion, either the subreddit or forum is the best place to go. Throughout its existence, Survival has been carried through several different map revisions. A new revision means a fresh start, clean of all worldly possessions on a brand new slab of land ready to be explored, built, and fought upon. Unlike our other two servers, it has come to be expected (and preferred) that Survival approaches a new revision at a much greater pace. As is more common nowadays, new revisions are often timed with respect to the latest and bigger releases of Minecraft (e.g. 1.5, 1.6, 1.7) that are pushed out by the team at Mojang. With this in mind, revision dates can vary oddly but the sweet spot for revision length generally settles around 2 months or thereabouts. Currently a work in progress, you will be able to find a more detailed description of each revision here. 2014-10-24 2015-02-06  A return to "normal" survival. Citadel and Prison Pearl plugins removed, safebucket plugin returns. Griefing is no longer allowed, now including animals. 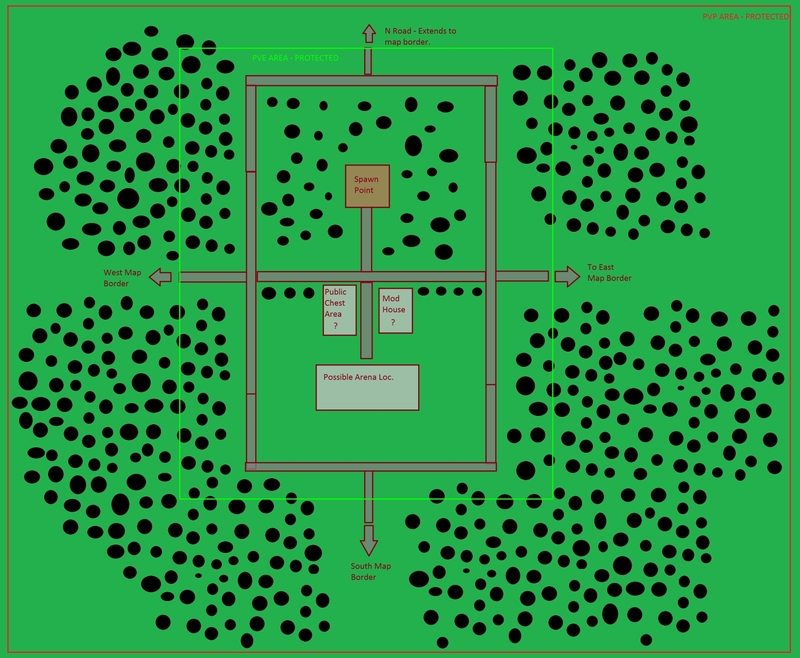 2014-6-9 2014-7-13  Experimental revision featuring no roads and random spawning. Being used for brief change testing/plugin testing for S.
2014-03-15 2014-06-05  Bringing us back to our roots somewhat, Revision 24 carries a notion of taming things down. Spawn is a much simpler, more traditional design that harks back to much older revisions. PlumpXP was pared down from 8x to 4x the vanilla amount of experience gained, and Simple Clans was removed from the server plugins. Following the launch of the revision, a couple of additional server changes were brought on board. 2013-12-22 2014-03-12  Launched following the release of Minecraft 1.7, Revision 23 introduces a plethora of new changes to regular server gameplay. 2013-08-11 2013-10-25  First revision after release of Minecraft 1.6.2 patch. Started at UTC (GMT/Zulu)-time: Sunday, August 11, 2013 at 00:00:00 subreddit announcement. 2013-04-06 2013-08-11  First revision after release of Minecraft 1.5 patch. 2013-01-11 2013-03-13  First S map to use custom terrain. Brought back use of all enchantments. 2012-11-05 2013-01-11  Coincided with release of Minecraft Release 1.4. 2012-10-05 2012-11-01  Experimental revision featuring 4 cardinal roads, nether portals at cardinal 500 and 1500 - no warps/hidden portals/PVP enchants. Spawn by Randomdoor. 2012-08-10 2012-10-05  Coincides with release of Minecraft Release 1.3.1. Features 6 warps, 4 named roads out of spawn, complete ringroad at 500 blocks, 4 public nether portals, 4 hidden nether portals. 2012-07-01 2012-08-09  Down to 4 portals. H-shaped road network. Had the Crucible, now it's the Cruciblue. 2012-04-27 2012-07-01  New spawning system using warp signs and 8 portals with connected road. 2012-03-04 2012-04-27  Creation coincided with the release of Minecraft Release 1.2.3. Delicious, delicious drama. 2012-01-26 2012-03-03  Creation coincided with the release of Minecraft Release 1.1. Small resurgence of Clan-based PvP. 2011-09-15 2011-11-20  Creation coincided with the release of Minecraft Beta 1.8 Also this map has no prebuilt roads.The roads are willfully constructed by the players. 2011-08-19 2011-09-15  Switched from 4 to 2 roads. Corruption led to a fun temp map. 2011-07-09 2011-8-19  Creation coincided server BlackLotus server migration. First map with ring road. 2nd Golden Age of Survival PvP. 2011-05-26 2011-07-09  Creation coincided with the release of Minecraft Beta 1.6.0 First map with non-enterable spawn. 2011-04-13 2011-05-26  Last map with returnable spawn. 2011-02-20 2011-04-01  Creation coincided with the release of Minecraft Beta 1.4. 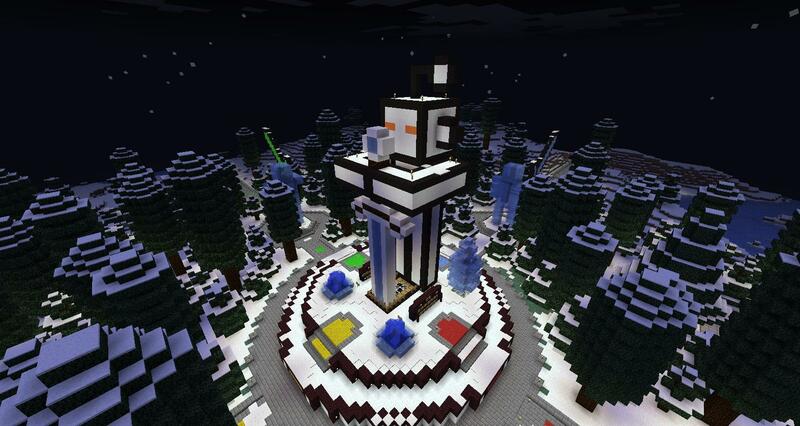 Original design of spawn 1st Golden Age of Survival PvP. 2010-12-25 2011-01-27 Ø Creation coincided with the release of Minecraft Beta 1.0 (and the creative map). PvE cities. 2010-11-22 2010-12-19 Ø Item duping fixed. PvE-buildable spawn area. 2010-11-03 2010-11-21 Ø Server established after health was implemented into SMP. Plagued by item duplication exploits due to inventory being stored on the client side. An always popular part of the Survival server, arena events involve any number or variation of premeditated combat scenarios where fighters volunteer to battle it out in the hopes of winning fame, glory, and some sweet, sweet loot. Each revision typically has a designated arena that is opened solely for staff-hosted events, and these are best enjoyed at frequent intervals throughout the entirety of the revision. Additionally, a new revision may also have an accompanying 'public' arena, designed to be free to use by anyone and without the otherwise necessary staff involvement. Players are encouraged to get involved with arena events in any way that they can, as it is a shared pastime enjoyed by many! While an evening in the arena is a long-standing tradition within Survival, it is by no means the only one! Remember that combat occurs both on and off the arena floor, and you are more than encouraged to seek PvP encounters in your day-to-day experience as well. Some players like to record the action and post YouTube videos. Feel free to add your own! Refreshed with each new revision, the Survival Leaderboard highlights the PvP capabilities of the current server population in accordance with one another. The page does not calculate updates in real time, so don't be discouraged if you land a high-ranked kill and you don't immediately see a change in your position on the leaderboard. A more in-depth look at the aims of this system and how it all works can be found here. This page was last modified on 2 February 2016, at 22:20. This page has been accessed 195,576 times.